Dedicated to providing educational and cultural events to the Brevard County community. 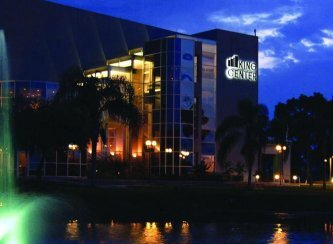 The Maxwell C. King Center for the Performing Arts has been providing cultural and educational opportunities for residents and visitors of the Space Coast since 1988. This 100,000 square-foot facility features a 2,016-seat main theatre, 288-seat intimate studio theatre, and a Crown Club VIP room for members of the Crown Club to enjoy special benefits. The King Center presents a variety of performing arts and entertainment, including musicals; plays; symphonies; blues; jazz; dance; children's theatre; comedy; drama; ballet; pop; rock; country; lectures; family shows and more. Click here for our schedule of upcoming events! The King Center offers memberships, events, and special programs to benefit the community, as well as quality shows for entertainment.